Turn a broken gardening pot into a creative flower planter out of its pieces. 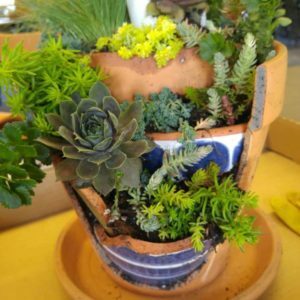 Participants will learn how to create their own succulent garden in a broken terracotta pot from this two-hour hands-on workshop. If fairy gardens are your thing, you can add a few miniatures and there you have it! Charlotte Croft, garden consultant, will be leading this workshop and will share her knowledge to help participants gain knowledge needed to grow and maintain succulents in a one of a kind broken pot container. Cost of the workshop is $35. A pre-broken pot, soil mix, and a variety of succulents will be provided. Participants are encouraged to bring 2-4 pieces of broken gardening pots they may have at their home. Registration is required and will close July 16 or when full. Space is limited to 20 participants. You must register by calling N.C. Cooperative Extension at 336.401.8025 or register online. • 2018 Horticulture Workshops - Sign-Up Today!